This page describes optimizations to a large application and to the kernel, to shorten the time required to load and execute an application. Two main techniques are described here: 1) use of mmap vs. read and 2) control over page mapping characteristics. These techniques are discussed below. Kernel bootup time is drastically improved with recent efforts including CELF activities. As a next step, application bootup time should be considered to cut down the system total bootup time. The techniques described here are applicable to a large number of embedded systems, which consist of large, single-application programs. An application may load a large amount of data when it is first initialized. This can result in a long delay as the file data is read into memory. It is possible to avoid the initial cost of this read, by using mmap() instead of read(). Instead of loading all of the data into memory with the read system call, the file can be mapped into memory with the mmap system call. Once the data file is mapped, individual pages will be demand loaded during execution, when the application reads them. Depending on the initial working set size of the data in the file, this can result in significant time savings. (For example, if an application only initially uses 50% of the data from the file, then only 50% of the data will be read into memory from persistent storage. There is extra overhead due to the cost of page-faults incurred in loading the pages on demand. However, this page fault overhead is offset by the savings in the number of page reads (compared to the read() case). To further improve this method, the kernel can be modified to reduce page copying and page faults. When pages are demand loaded to a memory-mapped file, the pages are kept in memory as part of the kernel “file cache” and mapped into the requesting process&apos;s address space. If the page is accessed via a write operation, then the page in the file system cache is copied to a newly allocated memory page. (This is referred to as "copy-on-write"). The copied page can be then be freely modified by the process which maps it. Suppose, however, that a file is mapped or accessed by only one process. Then, copying the page is redundant. In this case, we can convert the page in the file cache to a private page immediately. By utilizing this assumption (only one user for the page), the cost of the copy can be eliminated. This has the side benefit of reducing memory consumption as well. In some cases, an individual page in the process address space is accessed first with a read operation, then with a write operation. This results in two page faults for the same page (one to load the page and move it "through" the file cache, and the other to get a local copy of the page.) By eliminating the page copy, and making the page private on the first access (whether read or write), the second page fault can be reduced. The current system is experimental, in the way it manages the files affected by this caching/virtual memory customization. It would be better to control this mechanism per file or virtual memory area. The fcntl system call or mmap system call are candidates where this control could be introduced. 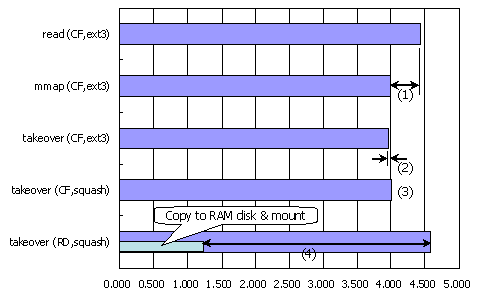 read(CF/ext3) The data file is loaded using read system call from a ext3 file system on a CompactFlash memory. mmap(CF/ext3) The data file is mapped to the process virtual space using mmap system call. takeover(CF/ext3) The data file is mapped and the page in the file system cache (which is created during page fault handling) is converted to private page immediately. takeover(CF/squash) Same as No.3 except using the SquashFS file system. takeover(RD/squash) Same as No.3 except the file system is on read from a RAM Disk instead of Compact Flash. As the result of using mmap system call, bootup time is reduced by about 400msec (10% of total init time). By using the takeover method, page faults are reduced to 317 times, versus 496 under the mmap method. Also, redundant page copies are eliminated. As the result, about 40msec is eliminated. 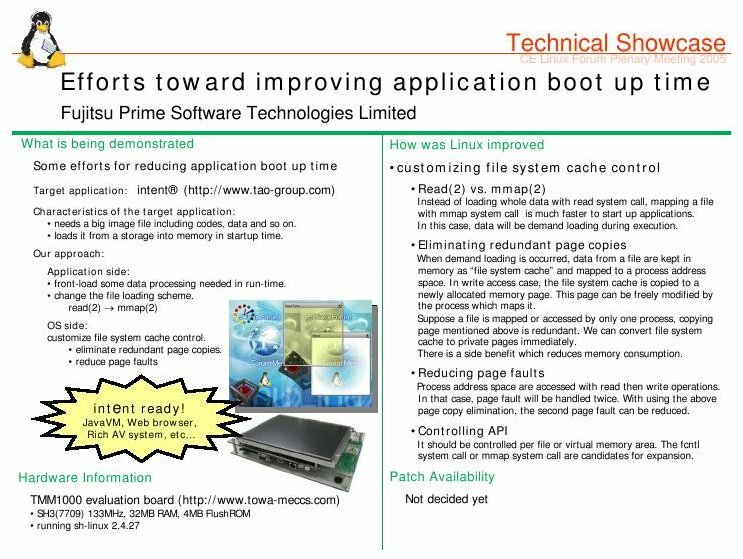 Squashfs is compressed ROM file system and there are some extra cost to access data, decompression and so on… But the performance is not so bad against ext3fs. Using squashfs is a good choice to reduce consumption of storage spaces. device which stores the file system image is enough fast and extra RAM usage is affordable, it might be a good choice to reduce bootup time. I&apos;m considering to implement similar file cache control using fadvise system call under 2.6 kernel.